It’s been a slow start to the spring. The weather has been cold, cold, cold, rain, rain, and a little bit of snow thrown in there for good measure. Even our sunny days have mostly been cool. We’ve only had a couple of days where I’ve been inclined to go out without a jacket. Fortunately when Dan’s dad was up to visit last week the afternoon happened to be one of our gorgeous days, and we managed to get the gardens all cleared up, between the three of us. I haven’t really had another opportunity since then. Where I’ve noticed this cold weather most has been in the moths. There just haven’t been any, really. The first moth this year (first macromoth, that is) was really late compared to the last two years (March 17 this year, versus March 8 and 6 in the previous two, respectively). 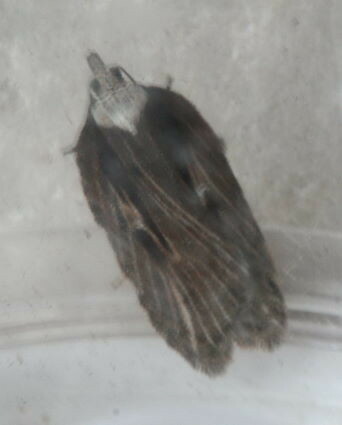 And I didn’t see another macromoth until last night – which, for the record, is now April. To put this in perspective, by this time (April 5) in 2009 (the only spring where I actually kept count for the first couple months), I had tallied nearly three hundred individuals. This year I have eight macros and perhaps half a dozen micros. So forgive me if I get a little excited over my handful of moths. 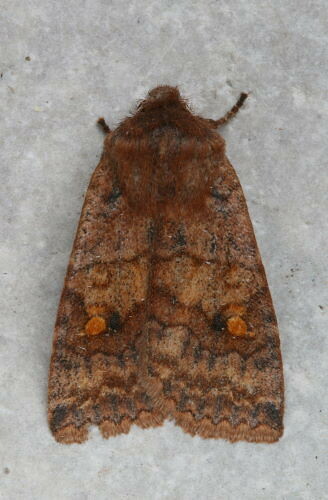 The leading species here is a Three-spotted Sallow, Eupsilia tristigmata. It’s yet another of those early-season Eupsilia species, two of which I’ve already recorded for this year (Morrison’s and Straight-toothed). In fact, I got another Straight-toothed last night, as well, but didn’t feel the need to photograph it. Three-spotted seems to be more common here at this house than it did at the lake house – I got hardly any there, but I catch them regularly here. They look somewhat the same, but the large, dark spot beside the orbicular spot is diagnostic of this species (the Straight-toothed, recall, has the large spot flanked by two tiny white ones). The other three moths I have are from the night before. This first one is a semioscopis, the first one I’ve seen this year. The semioscopises (semioscopi?) are gray with longer, somewhat teardrop-shaped wings, and are another of the early-season groups, often one of the first I encounter at the start of the season. This one’s an Aurora Semioscopis, Semioscopis aurorella. 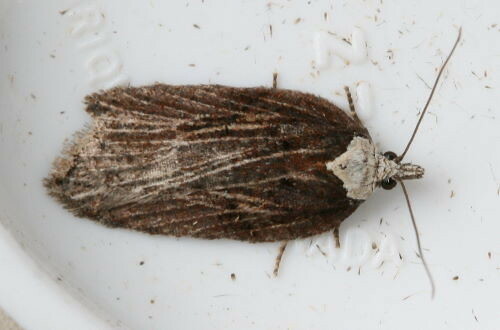 The last two are both the same species, showing slightly different markings: Hasty Acleris, Acleris hastiana. 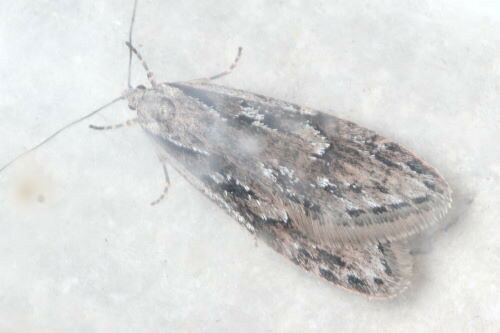 The aclerises are a huge group, many of them confusingly patterned, and can be encountered all year, but a few members of the genus, including this one, overwinter as adults and as such are often one of the first moths encountered in spring. I’m ready for the mothing season to begin in earnest any time now. I’d been planning a trip down to the area of our old lake house, where I’d encountered all the Infants (Archiearis infans and Leucobrephos brephoides); that spring they were out and flying by last week of March, but I’m still waiting for appropriate weather this year. Soon, I hope! More moths down here in the Arkansas Ozarks, but still lingering winter and a slow start to spring mothing. The colors in the first moth are beautiful. Nicely done. If you are having trouble with the frisky micromoths, try experimenting with your flash to “freeze” their motion to get a sharp image. Your in-camera flash has a short flash duration, somewhere around 1/1000 sec depending on the power setting. Think of it as a fast shutter speed. Put your camera in manual mode, set a shutter speed and f-stop to underexposure (ISO 100, 1/60 sec, f8 should do it indoors) and use the flash.